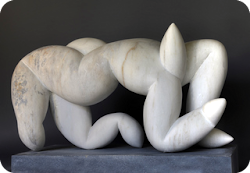 William Peers freestanding sculptures are primarily in marble, with the materials being sourced from Italy and Portugal. Tal was the inspiration for the exhibition ‘A Line in Space’. I find this form fascinating, and have carved several versions of it. This sculpture reclines, and I can’t help being reminded of Henry Moore. Are those languid limbs to some? A double loop, almost touching along its length. This is the most compact of the series and we are thrown off the scent of its regularity as it is balanced off-centre. Loren lies back, and it is unusual in the series as the resting point is far from the centre. At Sandlin the children danced in the dark with sparklers. The lines of the sculpture remind me of great sweeps of light. Deceptively simple; this form is astonishingly difficult to balance. The weight is low and the circle eccentric, giving rise to the speculation: Is the irregularity causing the thinning? Or gravity perhaps? The base with its two feet lends Lyra a figurative feel, and the unbalanced sculpture seems as if it is moving. For a while Owello was too regular, too balanced. I pushed (not literally as you cannot push marble) one side up in relation to the other to give some restlessness to it. One of the most challenging sculptures of the series, technically. I like the negative space trefoil. Double rings almost touching whizz round on a solid base. Almost round, yet a tension seems to exist between the earth and the sky. This ‘tug of war’ might have caused the thinning. This is pushing the eccentric circle even further. Some convex forms become concave and thin at the point of most change. Both irregular and balanced, the trajectory seems uncertain, hesitant and yet still as the weight is central. Timolin is flatter and wider than Tasil and Tulla but with the same double loop. Not one, but two, loops in space. Here I tried to push the eccentricity to one corner and let the rest be still. A particularly lovely piece of Portuguese marble, and one of the first bases that moved away from the rectangular. I have tried variations of this theme. Here the section is a trefoil and the twist quite gentle. I like forms that loop and trap the eye for a moment. I vacillate between very regular forms and those that are less so. This sculpture was undecided for a while before I found this solution. I like it when a sculpture really is a voyage of discovery. Elias has a change of direction. There were square edges that I took against and am happy I did. Now with softer lines I could concentrate on the balance alone. Here the ring wobbles and the balance is sought from an unbalanced beginning. I had a real fight to make it work and now love the result. Ideas often lead to variation. In ‘Carlow’ the structure used in ‘Galvano’ was reduced to points. The angular mechanical edges give way to soft undulation. At least twenty years ago I carved this pattern in a relief carving. I wanted to try the pattern wrapped around a sphere. Here, and even more tricky, I wrapped the same pattern seen in ‘Lynaeus’ around a ring. This has a much more mathematical feel than most of my work. Actually the segments are marked out with string rather than with any fiendish mathematical calculation. Here the twisting motif bends to form a saddle. Birds, weather vanes and horses come to mind. Sculpture where there is no end to the flow interests me. The form circulates as do the forms upon the form. I was very glad to find a split piece of marble with natural rust staining, for the sculpture to sit on. A larger version of ‘Lunasa’, sitting very happily on a rough piece of Tunisian Black Marble. The twisting design adds tension to the ring and gives the sculpture power. I love the colouring on this marble. This is such a wonderful material to look at but very difficult to carve. The twisting design feels very different on the dark stone. I wanted to try a circular form with the same patterning and a smaller hole. The difference, in size and shape on the inside to the outside, is correspondingly much greater. I wanted to see how the twisting motif employed in ‘Corinth’ would work on a vertical form. I left the top rough (as well as a small section of the bottom) to remind us that it was made from a natural material. It brings to mind an ancient architectural remnant too. These soft forms, joined to make a ring, bring to mind all sorts of good things to me. Boiled sweets, polished pebbles on the seashore, old bars of soap, coins worn smooth by countless pockets. The more I look, the more I see. This idea led on to ‘Gamelin’ (below). Here the discs are smaller up above, giving the sense that they are going right up into the sky. After focusing on making circular forms with touching segments, here I am trying to simplify things with just three forms. Making each form work in its own right - as well as touching the others - is tricky. The loop with a twist. Rarely is a sculpture interesting from all sides. This one is, I believe. We look in inside this world and see a moon or sun. The inside form is balanced with the outer form. A new thought, playing with this heavy texture to animate a surface. This is the first time that I have employed these wisps - animating the surface. Suddenly the wedge form becomes bristling or scuttling. The texture, once more, giving enormous movement to this curling form. With its multiple forms falling, or perhaps rising up. Is it growing or cascading? I’m not sure. Very gentle and smooth on one side, and aggressive on the other. I am happy to have introduced this element. Flowing forms from constraint to liberty. Reminiscent of ‘Kotori’ and birdlike figuration. The very start of a series of sculptures, exhibited at John Martin Gallery in 2014. The fitting together of two forms. Is it a figure? This is the simplest - and to my mind - one of the most satisfactory sculptures of the series. The first step away from the ‘alkathene joint’. The segments are separated from each other. Independent. They climb and twist. The segments get very small and thin towards the top. Trying to reach upwards. The forms and symmetry of the void are nicely balanced here. I made a larger version of this a little later on. This sculpture of joined segments leaves only a tiny hole in the middle. The strength and presence of the hole becomes as powerful as the forms themselves. One of four small rings of segments that came out of a single block of marble. They work together wonderfully as a mini series within the exhibition. Here: tiny, sharp, angular segments. The fourth in the mini series. Here the angled forms give the sculpture movement and life. Is it spinning? Following the circular segmented forms, what would it be like to visually twist the circle up? Technically very awkward that’s how! The few inches inbetween the passing forms take as long as the rest of the sculpture. Ever changing as you walk around. Here I go from technical trickery, to technical lunacy! A double twist. This is the only sculpture in the series where I abandon the segmented forms - I feel they might have over complicated an already complex form. One of the simplest and free-flowing of the series. Stacked forms but in a loose, slightly more arbitrary way than some. My young son calls this the ‘Stack of Books’. He is right. The simple twist by way of animation works well here. It also brings to mind oriental temples. The first, smaller version of the ‘Stack of Books’. The forms are curved in all directions giving great animation. A larger versions of one of the four from the mini series of rings. Lovely in the landscape. I have an idea to carve a bigger version still. Here the segments sit on top of one another like squared mushrooms. How it changes everything - making the underside curved. The ferns that grown in the hedgerows in Cornwall unfurl like this. Stacked forms enjoying the vertical and the circular ideas in one. A second version, where the smallest forms continue upwards. By cutting the marble cleverly it becomes so animated that it is hard to imagine that the sculpture came from a single block. Here the diminishing segments twist and fall again as they die out. Lots of very awkward little gaps to bruise the knuckles on. Ouch! The largest sculpture in the series with fantastic colouration. I love the animation created by the segments changing direction. I love this bend. It came from looking at a bent piece of plastic pipe. The end hovers off the surface of the base: almost touching. This work feels like a transition into a new direction. The bent articulation is still seen but the curling limbs and opening of the void are new. There is more air than stone. I carved a series called 100 Days. This carving was after the end of that series and was the continuing the point I had reached. The figure is articulated with a device discovered and employed during the second half of that series. This is as if two forms have been put together. The articulated limbs below and the triangular motif above that reminds me of Gaudier Brzeska. He was one of my earliest passions. The whole assemblage is very energetic. This first sculpture I have carved in this wonderful Onyx. Hard and brittle; more like glass than marble but with a wonderful translucence. This undulating form in Esmarelda Onyx mirrors the shapes found on the front on the back. The top and bottom edges have a rough crust that only serves to enhance the extraordinary colouration found within. This Esmarelda Onyx is so crazy, so exotic, so overwhelming that only a simple form works best. It is also very liable to fall apart if there are parts sticking out of it. Onyx is quite, quite different from marble - more translucent. The forms need exaggeration in order to be read. With the sun on it, this torso glows. This joyful figure with huge limbs sprints forward. She has wonderful warm colouration on her front which is typical of marble from this area of Portugal. This figure is after Egyptian carvings I have seen and loved. The figure is striding out, yet formal and still. This swimming torso delicately balances on her belly. I enjoyed thinking about the roll of the trunk and trying to put it in the carving. I love carving these figures. The strength, or rather weakness, of the marble demands that the limbs are massive. The constraints of the material lead the way.